Established in 2005, Nam Hong is a construction and engineering company that provides piping services, structural works and manpower provisioning services. Since Nam Hong is licensed in public sector works, chances are you’ve seen many of the upgrading works that Nam Hong has worked on around Singapore. Some of the projects that Nam Hong has participated in include Pulau Seraya Power Station, F1 fencing and construction of the new MRT lines. In the construction industry, projects are fluid and the time for the workers to report to work is not always fixed. When pressed for time, workers sometimes have to put in overtime hours and work on the weekends as well. What Nam Hong uses to keep track of attendance is a pen-and-paper logbook where workers line up to sign in and out daily. For the construction workers, it’s a straightforward process. However, it’s a different story for the administrative staff at the end of every month. It takes the administrative assistant a couple of days to manually compute payment, denting productivity. To complicate matters, aside from the standard rates there are overtime rates and special rates to take into account, increasing the chance for human error. 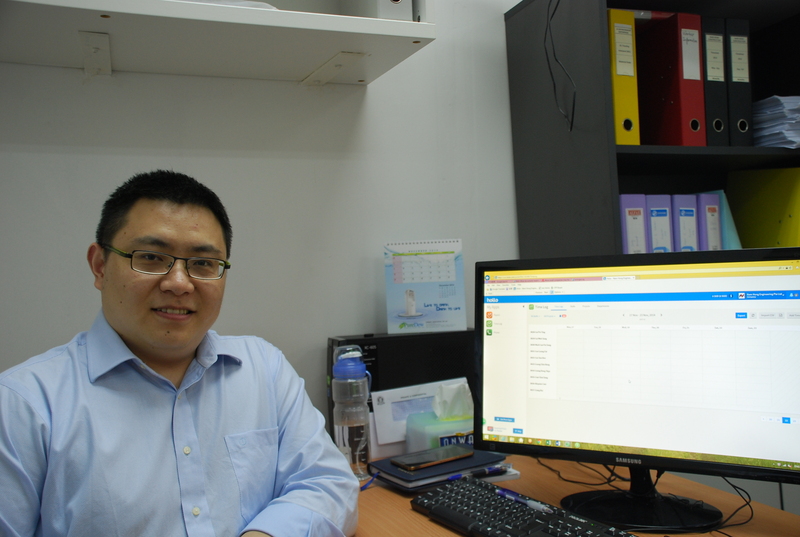 Frustrated with the inefficiency, Eddie, Nam Hong’s Accounts Manager, tried out Hoiio’s Time Log and Payroll apps. Both are cloud-based software aimed to improve workflow efficiency and are used hand-in-hand. 1. Using an iPad as time clock, their workers take a selfie every time they clock in and out to verify their attendance. This way, it no longer becomes possible for buddy punching to occur, and managers also get real-time updates if a worker is late. 2. Time cards are automatically updated to the cloud and the data is synced into Payroll. 3. At the end of the month, the admin assistant or accounts manager logs into Payroll to retrieve the auto-computed payslips. Automating mundane business processes may be common for tech-savvy companies, but it’s taken the construction industry some time to catch on. Construction firms tend to rely on traditional methods due to a lack of efficient IT software to handle time-based calculations. “I’m a tech-savvy guy myself and have been searching for a suitable solution to this. However, as our payroll involves time-based salaries, the usual payroll software doesn’t suit our work processes,” says Eddie. Francis, Eddie’s team mate, finds Time Log and Payroll easy and effective. To enquire more about Time Log and Payroll, please contact sales@hoiio.com.